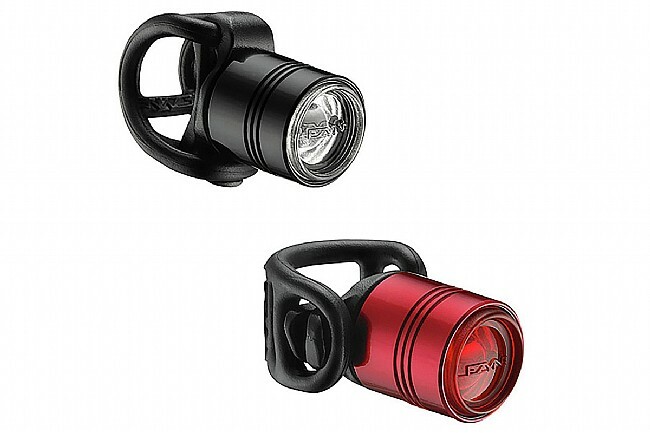 Stay visible and stay classy with these compact and elegant safety lights from Lezyne. 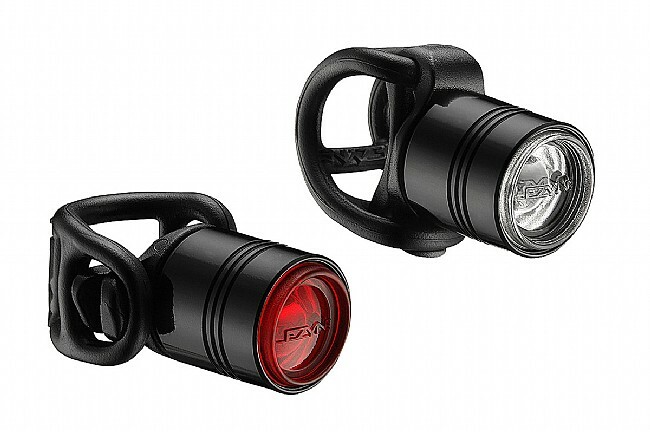 A mere 22 grams each, the Femto Drive Mini Lights attach to handlebars, seatposts, and so on with simple silicone straps. No unnecessary thrills or details; the power button has even been integrated into the lens of each light; just push it in to cycle through four flash modes and one constant mode. Despite their tiny size, the front light emits 15 Lumens and the rear 7 Lumens. Made from durable and weather-resistant CNC-machine aluminum, with high-grade optical lenses. Run on included CR2032 batteries. Front and rear Lights are included in this set. System weight: 57g (actual). Simple to install and use. No frills. just something to do the job without adding weight or big bulking mount. The light only works sometimes. There is bad contact between the battery and the bulb. Instructions were not clear. Lights are hard to mount. I use the lights on my bike. Have very little positive to say about it. very easy to strap onto the bike (handlebar and seat post for me) and works well. discovered that by holding the light in for a longer period of time-when you press to change light options-turns the light off. much easier than my mistaken belief that you have to cycle through all the options before getting to off. so packaging is horrible, no instructions is a mistake easy to just print a few lines on the box, but useability is great. The packaging on this product is so inane that you will, like me, want to line up the person who designed this and slowly [insert unpleasant bamboo-related scene here. -Staff]. I cannot overstate the difficulty of opening-no, of trying to dismantle the plastic casing and the thick and overly tight zip tie assembly holding these two small and lightweight lights. I believe Lezyne searched high and low for a person to design this packaging and they came up with the same person who conceived of the German Engima machine. You will spend 15 minutes trying to open this package in a way that will not to destroy the product itself. It can be done. I did it...but you'll never get that time back and it's very easy to cut yourself on the tip of the exposed zip tie which for some inexplicable reason has been sharpen to the point of a sewing needle. Meanwhile there are no instructions for securing the lights to a bike so study the pictures on the website. I like the push onoff feature but unfortunately there are 5 different flashlight options, so it becomes rather tedious to cycle through them all just to get to off. Why not have on, flash and off? No-no-no-no there are four different flashing options. I'll update the actual product use quality after using it a few times. The only concern would be the security of the rubber loops around the plastic tabs-one end is fairly loose, probably purposely to help wrap around the bars. Nice, small light, light weight. Has a clip on the back and a rubber strap. I got these to add to my basic lighting. A simple function front and rear light attaches to cable housing. Very effectively efficient for traffic to see you on road rides.